Scottish independence: What might it mean for sport? If homeowners displaying campaign posters in their windows was a sport, Scotland's "yes" campaign appears to be leading the "no" team 4-0 with three minutes to play. That was certainly the impression in Glasgow's West End last weekend, where the tightness of the polls and no-minded leanings of the bookmakers were not borne out by my less scientific methods. Of course, to continue the football metaphor, there is a big difference between winning the pre-match singsong and claiming the points. The situation is very different in the realm of Olympic and Paralympic sport, where it has been difficult this week to find athletes, coaches or administrators willing to nail their Saltire to the mast. That is not to say they do not exist, it is just that with Rio 2016 less than two years away they are more reluctant to swap the certainties of the union for the promise of independence than many of their compatriots. The all-encompassing significance of Thursday's referendum has been well-documented elsewhere, and it would be silly to pretend sport is a key factor in the debate. Compared to the currency, jobs, the price of food, Scotland's place in the world and Strictly Come Dancing, the games people play is small beer. But that does not mean it does not matter. Anybody who has witnessed an England-Scotland football or rugby union match will know how sport has provided an outlet for Scottish national identity for decades, just as Andy Murray helps demonstrate how much a small but resourceful nation can achieve in the world. But those are examples of sporting particularism that Thursday's vote will not affect. Scottish football is already proudly independent, as is rugby. Equally, golf's Open will continue to be played on courses around the British Isles, just as Scottish golfers will strive to play in the Ryder Cup. Murray's case, however, gets closer to the real issue for sport in an independent Scotland: as an individual trying to win tournaments, no change; as an Olympian trying to win a medal…well, he will be wearing different kit next time, as he would on Davis Cup duty. For a wealthy athlete in an individual sport that is probably as far as independence will go in terms of impact. That would not be the case for most athletes in any Scottish Olympic or Paralympic team at Rio 2016, Pyeongchang 2018 or Tokyo 2020. There are 136 sportsmen and sportswomen who describe themselves as Scottish among the 1272 athletes funded by UK Sport's "World Class Performance Programme" - 10.7% of the total - and two thirds of Scotland's Commonwealth medallists this summer were nurtured in this way. Much has been said about the pros and cons of the joint venture brought about by the Acts of Union 307 years ago, but nobody can deny the impact UK Sport has had since 1997. National Lottery cash, targeted at winners, has seen Team GB vault up the medal tables. Scottish athletes have contributed hugely towards this, helping to win 13 of the 65 Olympic medals Team GB claimed at London 2012. But only three of those medals were wholly Scottish: Murray's tennis gold, Sir Chris Hoy's keirin gold and Michael Jamieson's breaststroke silver. Would Scotland win many of those other medals on its own? Would the Scotland-less Team GB? Speaking to Sky News in July, UK Sport's chief executive Liz Nicholl put it bluntly: "Certainly to start with Scottish athletes would win fewer medals if they were outside the British high-performance system, and Team GB would win fewer medals as a result of losing that Scottish expertise." It is a point the likes of Scottish 800m star Lynsey Sharp and badminton player Imogen Bankier have made, too. Sharp, a Commonwealth and European silver medallist this summer, told BBC Scotland she was worried about the implications of independence because she spent most of her time at Loughborough University, a place transformed by UK Sport money into a world-leading sports science centre. 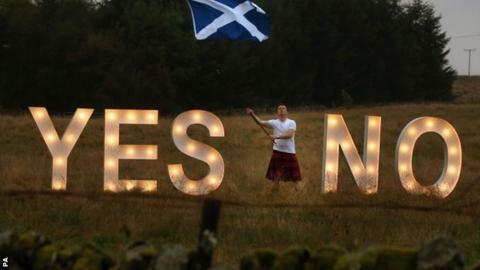 What happens if Scotland votes 'Yes'? "If Scotland is able to do that why hasn't it done it already?" asked Sharp. "We can tap into the English system and be part of Team GB when it suits us and use it to our advantage," said Bankier last year. "Independence would mean we would lose that." These views sound very familiar to James Allen from the Sport and Recreation Alliance (SRA), an umbrella group that represents more than 320 governing bodies throughout the UK. Allen, the SRA's head of policy, told me there was "huge uncertainty" among his members about the impact of a "yes" vote on facilities and elite funding. The pro-independence campaign has been light on details as to how the change from a UK model to a Scottish one will happen. It has simply stated it will be negotiated, like everything else, in the proposed 18-month transition period ahead of Independence Day on 24 March, 2016. Allen acknowledged that an independent Scotland would meet the International Olympic Committee's (IOC) two criteria for recognition - membership of the United Nations, and having at least five national sports bodies recognised by their respective international federations - he just doubts it is a given in time for Rio. This issue was studied by a working group of experts appointed by the Scottish Parliament's sports minister Shona Robison. Chaired by the former First Minister Henry McLeish, the group's report cited the recent examples of Estonia, Latvia, Lithuania and Montenegro as newly independent states that gained Olympic and Paralympic status "in a very tight timescale". With 11 governing bodies already "directly linked" to federations and early dialogue between the new Scottish government and the Olympic and Paralympic authorities, the report said there are "no obvious or major barriers to securing accreditation". Others, however, wonder if there will be time to achieve all this by July 2016, when qualification for Rio closes. If the timetable does slip - and other countries with similar tensions, such as Spain, would be happy for it to do so - Scottish athletes would have the choice of joining Team GB again, or competing under the Olympic Flag, as athletes from East Timor, Macedonia and South Sudan have done at recent Games. But none of this is as complicated as the issue of funding. Even McLeish's report, which was published in May, admitted it had been unable to properly "consider how an independent Scotland could develop transitional arrangements" from the UK Sport model, which will distribute £350m in the build-up to Rio, with a further £31m on winter sport for 2018. Most of this money, 60%, comes from the National Lottery, with the rest coming from general taxation. As things stand, there is no road map for how a unified Scottish funding body will get its hands on "its" share of the cash. The working group could only say that Scottish athletes should be funded at least as well as they currently are, wherever they wish to train, although this could result in additional start-up costs. The report's findings were based on 23 responses from sporting bodies and individuals. But they did not consult former British Amateur Boxing Association chairman Derek Mapp. Despite securing record funding for the sport on the back of five medals in London, Mapp was removed from his post last year when what he describes as "parochial rivalries" took hold of the sport. "The Scots in particular were obsessed with national pride," said Mapp, who set up an elite training base in Sheffield. "But they forgot what's best for the athletes. If you spread the cake too thinly you won't get the best, and if you're not careful you can quickly become second-class." Mapp based his GB Boxing model on British Cycling's much-admired approach in Manchester, so it was hardly surprising to read Sir Dave Brailsford's view on Scottish independence. "UK sport is one of the best things this country has and it is all possible because we can share talent, resources and ideas," Brailsford said on Monday. "My message to friends in Scotland is simple: it is for you to decide your own future but for the sake of UK sport I hope you vote 'no'." This all comes as no surprise to Sir Craig Reedie. A badminton champion from Stirling, Reedie is a former president of the International Badminton Federation, an ex-chairman of the British Olympic Association and a member of the IOC's executive board. "In my experience athletes tend to follow the funding," Reedie told me. "So I'm not at all surprised to hear that people are worried about the uncertainty that would follow a 'yes'." It is customary in BBC features to try and find a neutral position by balancing the voices on one side of the argument, with voices from the other. I have struggled to find them for this piece from within Olympic or Paralympic sport. But as I mentioned towards the start, that does not mean they do not exist. They do, as Scottish swimmer Dan Wallace memorably demonstrated when he channelled Mel Gibson by crying "For Freedom!" after winning the 400m individual medley in Glasgow two months ago. Although he later played down his actions on Twitter, Wallace was asked after the race whether he would follow the "route to freedom". "Yeah," he replied. "Definitely." It should also be remembered that curling is a Team GB operation made solely in Scotland, and that it delivered three Olympic and Paralympic medals at Sochi 2014. And there is much in McLeish's report on how a "reprioritised" sports strategy could lead to a fairer, happier and healthier Scotland in the future. Even the SRA's Allen admits existing Scottish policies on access to sport and recreation are "more progressive" than elsewhere in the UK. Ultimately, sport is all about overcoming obstacles, not accepting mediocrity, striving to be better, which is basically the conversation I overhead in Glasgow last weekend. Whether Scottish sport can achieve that best on its own, or as part of a team, is just one of the many talking points in what has already been a remarkable debate.